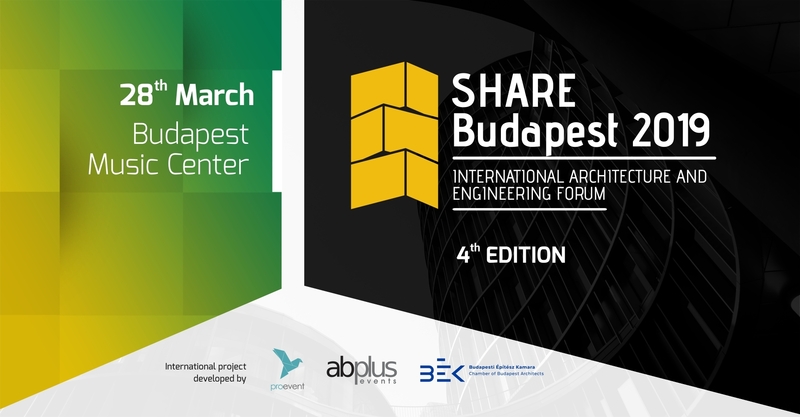 ABplus events, PROEVENT Association and Budapest Chamber of Architects are organizing on 28th of March the third edition of SHARE Budapest International Architecture and Engineering Forum. The event is accredited by MÉK, Continuing Education Accreditation: 2.5 points (2019/86). Arch. Csapó BALÁZS, President of the Chamber of Architects of Budapest and Mr. Florin Mindrigiu, Event Director and Founder of Pro Event Association will open this year’s edition. International speakers from countries like Norway, Germany, Serbia, Hungary, Netherlands, Romania, France, Denmark and UK confirmed their presence to SHARE Budapest 2019. This edition of SHARE Budapest 2019 will have 3 panels: Budapest Tomorrow – Large Scale Projects, Facades, and Special Guest lecture. Martin is partner in Snøhetta and Managing Director in Snøhetta’s Design company. With degrees in management, psychology, sociology and 20 years’ experience within brand-driven communication and design environments and projects, Martin is a versatile and professional advisor. His deep interest of the human mind combined with commercial understanding and ability, make him a strategic asset to design projects. At Snøhetta, he has led the design of Norway’s new banknotes, which went into circulation in 2017, the +Munch Exhibition series at the Munch Museum, along with projects for Barr and Under. His professional career spans from being Scandinavian Design Group’s New Business Director and Strategic Advisor, to planner for McCann Erickson New York. Other positions include strategic director at Leo Burnett. Martin also regular lectures and give talks all over the world. Martin’s presentation will address Snøhetta’s approach to design at all scales. From recent restaurant projects such as Under, to hotel projects such as Svart, Snøhetta’s work thrives at the transdisciplinary intersection of architecture, landscape, interiors, graphics, and branding and product design. Jürgen Mayer H. is a Berlin based German architect and founder of J.MAYER.H und Partner who studied at Universität Stuttgart, The Cooper Union in New York and Princeton University. His work has been published and exhibited worldwide and is part of numerous collections including MoMA New York, SF MoMA, Kunstbibliothek Berlin, State of Berlin Museum Prussian Cultural Heritage Foundation, Architekturmuseum der TU München as well as numerous private collections. National and international awards include the Mies van der Rohe Award, emerging architect, special mention 2003; Holcim Award, winner Europe bronze 2005 and Audi Urban Future Award, winner 2010. Jürgen Mayer H. has taught at Princeton University, University of the Arts Berlin, Harvard University, Kunsthochschule Berlin, the Architectural Association in London, the Columbia University, New York and at the University of Toronto, Canada. He is member of the advisory boards at Princeton University Architecture School, The Bauhaus Stiftung Dessau, Flussbad Berlin e.V. and Make Shift Architecture Festival Berlin 2015. Juergen Mayer H. has been invited as a visiting critic at numerous institutions around the world, including Harvard University, Princeton University, Cornell University, University of Michigan, UCLA, UIC, T.U. Berlin, ETH Zurich, Rice University, TU Darmstadt, Delft University, Architectural Association and the Royal Academy in London. Martin (1966) is a founding partner of OKRA. His strength is defining strategic visions and scenarios and creating strong spatial designs. He is mostly active in the design of complex urban and landscape development projects, working to the knot. He is fascinated and driven to integrate socially relevant themes, such as design for all and climate-resilient design. Within his work, themes like connected city, vibrant city, healthy city and attractive city are all interrelated with social, economic and ecological sustainability. Levente Szabó is an Associate Professor and the Deputy Head of the Department of Public Building Design (BME Faculty of Architecture) and one of the lecturers of the Doctoral School of Architecture, as well as the editor of the thematic yearbooks. Three of his students have already obtained the doctoral degree. He is a member of the Committee on Architecture of the Hungarian Academy of Sciences (MTA) and also a member of the Committee on the History and Theory of Architecture. He is the author of more than sixty analytical architectural articles and studies published in the Hungarian and international press, he has written 1 book, 4 book chapters, presented lectures at more than ten Hungarian and international conferences. He has been invited to participate in the work of several international juries of design competitions. He received national and international awards, published in Hungarian and international newspapers, a number of his works exhibited in Hungary and abroad have been realized. He is the CEO of the architectural studio, named Hetedik Műterem. Christoffer Harlang graduated from the Royal Danish Academy of Fine Arts in 1983 and was then employed at Henning Larsen’s Drawing Room. He studied some years in London at the Architectural Association and Rome at the Accademia di Danimarca and later became a Ph.D. in architecture on a thesis on Nordic modernism. Shortly after graduating from Professor Erik Christian Sørensen, he was attached to the Academy of Arts as a teacher. In 1992 he established his own studio, which later became part of Harlang + Stephensen Architects. Has received 1st, 2nd and 3rd prizes in Danish and international architectural competitions. Designed studio for the pictorial artist Milena Bonifancini in 2006, single-family houses and holiday homes. Together with the furniture designer Nicolai de Gier, he has designed furniture for the Ribe Art Museum in 2010, and for Løgumkloster Church in 2014. Designed for Politiken Frit Lejde Pavillon at the Town Hall Square in 2012. In 2013 together with Arkitema Architects won the competition for a new visitor center at Hammershus on Bornholm. Harlang serves as an advisor to private and public companies and foundations. Since 2008, he has been a professor of cultural heritage, transformation and restoration at the Department of Building Culture, the Royal Academy of Fine Arts, School of Architecture. Harlang is the author of several books and journal articles on Nordic architecture and design in particular. In 2004-2007 he was chairman of the board of the Danish Arts Foundation and has had several positions of trust within his profession, among other things. he has since 2007 been chairman of the Special Buildings Vision set up by the Ministry of Culture. Based in Paris and Milan, the Antonio Virga Architecte agency has been working for over 15 years on public facilities and shared habitats. That on projects of revaluation of the urban inheritance in constrained site and of interior refurbishment with an increased knowledge of the requirements related to the territories of expression of luxury brands (offices, showrooms, retail, apartments). In 2012, he and Vincent Parreira, l Atoll, France’s leading commercial ecopark, are awarded a multi-award-winning project that will seal their rich collaboration with many other varied and innovative programs. In 2016, they won together Réinventer Paris with a funeral parlor and an urban logistics platform on the Poterne des Peupliers site. He graduated at the Faculty of Architecture at the Technical University of Budapest. He accomplished his master classes at the Academy of Applied Arts in Vienna under the leadership of Hans Hollein, one of the pioneers of postmodern architecture. He worked as an associate in various European practices between 1991 and 1994 (Mecanoo, Boris Podrecca, Volker Giencke and Ernst Giselbrecht). He submits his doctoral degree in 2009 (DLA-degree; title: inverse tradition). By now he is leading 3h architecture together with Katalin Csillag. He devotes himself to architectural research beyond pragmatic design. One of the leaders of MOME Ecolab, founding member of Active House Alliance. He works on the principles of Hungarian social housing within the 4xM group. Zsolt Gunther won the Hungarian Ybl Prize in 2005. The pracice was nominated for the prestigious Mies van der Rohe Award in 2011 with their Institute for physically disabled. James Pickard co-founded the practice with Peter Cartwright in 1997 and runs our London office. He has market-leading skills in housing design, with a particular strength in developing buildable, viable schemes for challenging and complex urban sites and has helped the practice to develop a reputation for innovation and the practical use of offsite construction methods, with a particular focus on lean, low carbon solutions, air quality and wellbeing. James also has a particular expertise in workplace design and has recently overseen the London Borough of Lambeth’s new civic offices and refurbishment and transformation of Brixton Town Hall. He is currently involved in the design and delivery of a major new civic office and residential scheme for Crawley Borough Council. James has a passion for research and has carried out government funded research work into the design of low energy buildings and office occupier productivity as well as a running a current KTP into the potential for 7D BIM. He was invited by the Department for Communities and Local Government to sit as a steering board member and contributor to the Urban Land Institute’s ‘Build to Rent’ best practice guide for the private rental sector and sat on the main board of Constructing Excellence between 2005-2006. James has been an assessor for several industry award schemes including the Civic Trust and is an Honorary Professor at the Glasgow School of Art for his contribution to the Mackintosh School of Architecture. Iljana joined Carpenter | Lowings in 2005 and became Senior Associate in 2012. The studio is internationally known and has been influential in the development of the use of glass, both as a structural material and in relation to the effects of daylight in public space. The work synthesizes the fields of Art, Architecture and Engineering. From bridge design to domestic interior artworks, from large public façade projects to small scale temporary structures, it has been consistent in its emphasis on the pleasure of the fleeting experiences of daylight. The Museum of Transport in Budapest is one of Hungary’s oldest technology museums; its collection and exhibitions have been internationally known and appreciated as in the past as they are today. The museum has eight permanent exhibition places – two of these (the Museum of Transport and the Aviation Exhibition) are permanently closed due to moving. The museum – in its presently existing form, as The Hungarian Museum of Science, Technology and Transport – has come to existence on the 1st January 2009, by merging the Museum of Transport and the National Technical Museum. DILLER SCOFIDIO + RENFRO is going to design the new Hungarian Museum of Transport in Budapest. Their design for the Hungarian Museum of Transport preserves the industrial heritage and renews the spectacular former Diesel hall of the Hungarian State Railways to function as a museum in the future. Prof. Dr. Miklós Persányi holds degrees in Biology, Education and Environmental Engineering, he is Ph.D. in Political Science. He directed Budapest Zoo and Botanical Gardens between 1994-2003. Between 2003 and 2007 he served as Minister for Environment and Water of Hungary, was the President of the COP 9 of the UN Framework Convention on Climate Change in 2003/2004. He returned to Budapest Zoo in 2007. Was the president of the Hungarian Federation of Zoos, the chairman of the 300-member strong European Association of Zoos and Aquariums. He is Honorary Professor at the St Stephen University. Several of his zoo projects received high international recognition, and his major recent project between 2004-2020 is being implemented on the zoo’s extension land, in the form of a large-scale indoor zoo and aquarium, the ‘Pannon Biodome’. Guest Speaker – Sándor FINTA (HUNGARY) – Operating & Development Director Várkapitányság Nonprofit Zrt. Sándor Finta was the technical director of Budapest2024 Olympic bid having spent a successful period at City Hall as chief architect and the head of city planning department of Budapest. Prior to his appointment he was a founding member and a lead designer of Sporaarchitects, a Budapest based architectural design studio, whose works are regularly published in the local and international media. Among other architects, urbanists and artists he founded and became the chairman of KÉK – Hungarian Contemporary Architecture Centre which has become a relevant and internationally recognized independent non-profit cultural organization of contemporary architecture. He is owner and managing director of SPACEFOR which is an innovative company focused on architectural advice and design, sustainability and smart projects related to the built environment. Sándor Finta is currently deputy CEO at the Division of Development and Property Management at Várkapitányság Zrt., responsible for the Buda Castle and its environment’s seamless maintenance and renewal. SHARE Budapest 2019 International Architecture and Engineering Forum is an event organized by ProEvent Association in collaboration with the Chamber of Architects of Budapest.